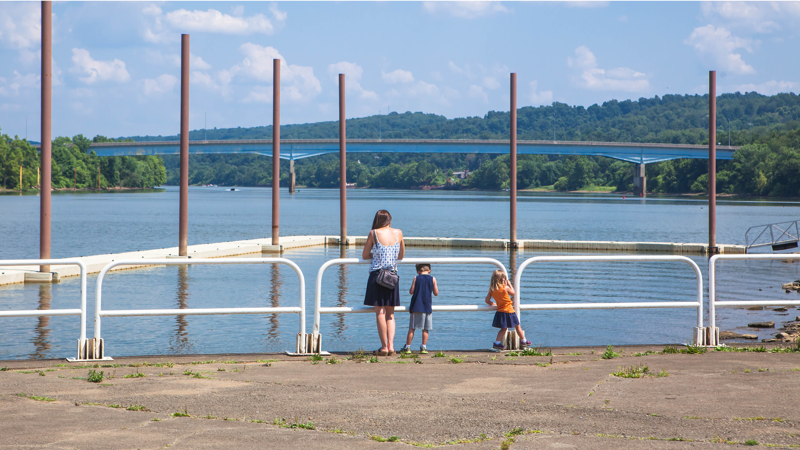 The River Town Program helps communities to recognize the river as an asset around which potential community and economic development can occur, and thus a resource worthy of protection. Success is built from the work of partners that recognize the inextricable links between the environment, the economy, and quality of life. The River Towns Program was developed by a principal of McCollom Development Strategies LLC (www.mccollomds.com) Cathy McCollom in 2010 and it is based on a community development approach known as asset based development. The initiative was originally launched by Pennsylvania Environmental Council (PEC) in 2010 in communities along the Allegheny River near Pittsburgh and in 2011 PEC became the fiscal agent for the Mon River Towns, contracting with McCollom Development Strategies to direct the program. 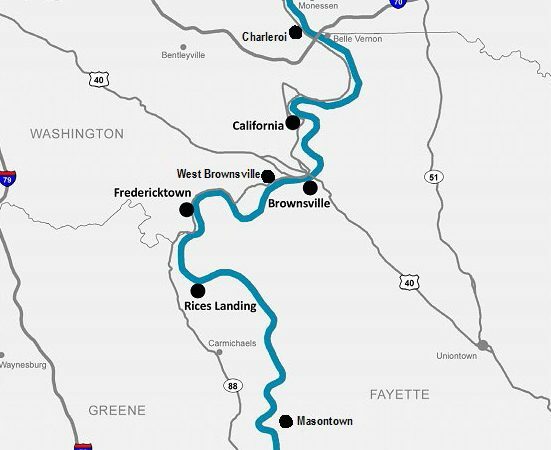 The National Road Heritage Corridor assumed the fiscal agency role in 2014 and its director, Donna Holdorf, co-directs with McCollom the Program. 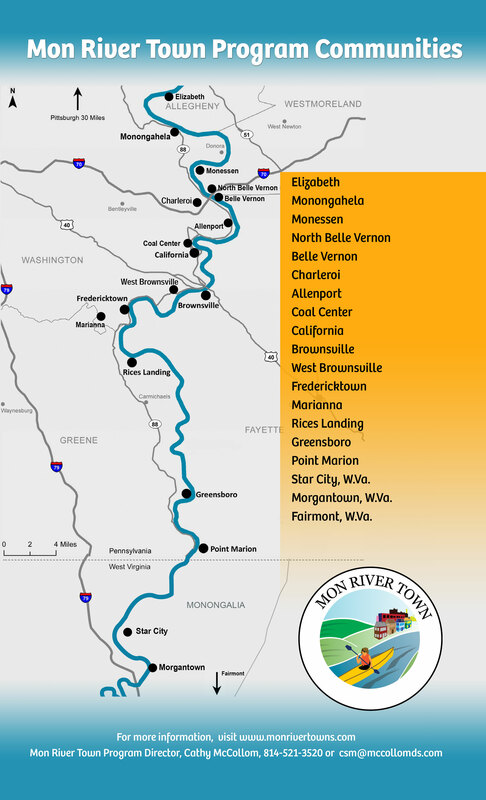 Conceived as a three-year extensive technical assistance program, the Mon River Towns began working in five communities, adding several over the ensuring years. As communities completed the River Town Program, they continued to collaborate on regional initiatives. This regional collaborative is now known as the Mon River Valley Coalition. To learn more about the Coalition visit www.monrivercoaliton.org. The overall objective of the River Town Program is to provide an efficient, effective, regionally-based resource to help local communities recognize the river as a potential economic and community asset, and thus a resource worthy of protection. The goal of this initiative is to improve the vitality, stability, sustainability and prosperity of communities, businesses and neighborhoods in currently distressed regions; to introduce the concepts of outdoor recreational market growth, sustainable development, conservation, and environmental sustainability; and to position these communities to attract new businesses and jobs to the area. The River Town Program has a regional-based focus and is most effective when working in multiple communities simultaneously. This is a program based on connecting municipalities to the growing outdoor recreational market as well as to one another in a regional effort. Working together, communities bordering a navigable and recreational river and close to longer distance bike trails, will have the greatest potential to capitalize on this program. The program has assisted communities along the Allegheny and Monongahela rivers in Pennsylvania and West Virginia; in four towns near the Schuylkill River and Schuylkill River Trail in eastern Pennsylvania and communities located within the French Creek watershed. Economic growth based on outdoor recreational services and businesses. Community engagement that connects residents with healthy leisure activities through outdoor recreation. Well-maintained business districts that offer needed goods, services and jobs and demonstrate continuous community reinvestment. Safe, clean, “green” and well-maintained communities that demonstrate continuous community re-investment. Effective, well-maintained and well-managed community infrastructure and resources. Economically and socially desirable land uses that support strong, vital, and healthy business growth, stability, expansion and turnover. Strong healthy communities based on a sound institutional foundation that supports strategic decision-making, informed action and continuous and lasting reinvestment. Click here to download the Executive Summary/Action Plan.